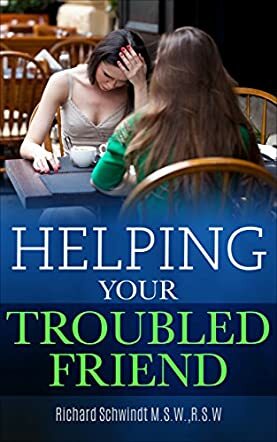 Helping Your Troubled Friend by Richard Schwindt is a practical and informative read that assesses the role of friendship in dealing with difficult emotional and psychological matters. It is told in a conversational tone and contains many anecdotes that help in explaining the content. The book stresses the importance of learning how to communicate effectively in a challenging conversation and researching topics that you may know little about. It also contains amazing insight on emergency situations, addiction problems, and relationship problems. Other topics that will help anyone understand and learn how to deal with similar conversations are also discussed comprehensively. The language is accessible to any reader as it contains only a few technical descriptions. It is not once that the revelation of a friend has left me tongue-tied, wishing for the right words to come to me and fill the awkward silence. Richard Schwindt’s timely and profound book, Helping Your Troubled Friend, has opened my eyes to potential responses that show affection and care and that will leave a distressed friend feeling better after the conversation. I like the practicality and simplicity of the messages too. The possible ways of directing a conversation presented in the book are easy to execute, even for someone with little or no knowledge of psychological issues. These ways include listening and allowing the friend to express themselves. I liked that underlying the themes of the book is the emphasis on being caring and doing the best for a friend, even if the response is not always perfect. Helping Your Troubled Friend is eye-opening and is truly a must-read.